Okay. . .so you finally took the plunge and had new insulated glass or “impact” glass windows installed in your home. Smart move too, because either one will lower noise levels; impact glass will keep your home safe and secure, and insulated glass will increase energy efficiency. But despite all that, you just can’t seem to get the temperature down in the really sunny areas of your home. The large expanses of glass and your overloaded air conditioning system just can’t seem to make it comfortable. You’ve been thinking about installing window film, but a quick call to your glass contractor killed that idea. He told you that an application of window film (or any other applied product) will void the warranty on your expensive new windows. So what are you supposed to do? Put up with heat and discomfort for the rest of your life? Not if you purchase Panorama® Window Film with its exclusive Premier Plus® Warranty! Premier Plus® not only backs your film with a lifetime warranty against manufacturer’s defects (peeling, cracking, loosening, etc. ), it will also pick up and match all the terms of your new glass manufacturer’s warranty as well; guaranteeing replacement value up to $1,750.00 per window if you were to experience seal failure in your insulated glass, or glass breakage after your film is installed. And if you should sell your home in the future, you can even transfer your warranty to the new owner for a period of five years. That’s the most expansive warranty coverage available today – from any brand of window film. 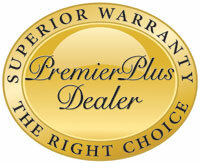 Solar-X of Sarasota is the area’s exclusive Panorama® window film contractor. For nearly four decades we have been bringing the finest quality window films and installation craftsmanship to our clients from Parrish to Port Charlotte and all the surrounding areas. Experience a level of professionalism that only factory training and continuing education can produce. Contact Solar-X today!